I love it when the 'Universe' speaks to me. Sometimes the interactions seem playful; at other times they come when I need reaffirmation, a good idea, or a sense of comfort. I'm not speaking of religion but of synchronicity, a term first coined by psychologist Carl Jung when referring to those quirky, odd connections or coincidences of events, which seem magically related. I had several such moments a few days ago. One happened while I was washing dishes. My mind wandered and I became aware of my worrying, that I've been doing it a lot lately and for quite some time. When did I become such a worrier? I never used to be this way and then out of the corner of my eye, I spotted a fortune cookie still sitting in its plastic wrapper sitting on the counter inches from me. I never pass on a cookie even when I know this one's bland taste isn't exactly going to make my day. So I dried my hands, tore the wrapper, cracked open the cookie, ate it, and read the message written especially for me. "Your blessing is no more than being safe and sound for a whole lifetime." Now, I just need to come up with an idea for this post. I'm clueless. Ideas don't usually hit until it's 'crunch time' which is right about now. All I keep getting is this tune playing over and over in my head... the one by The Rolling Stones called "Paint It Black"... the part that goes..."I see a red door and I want it painted black. No colors anymore I want them to turn black." Is this the 'Universe's' way of offering help? 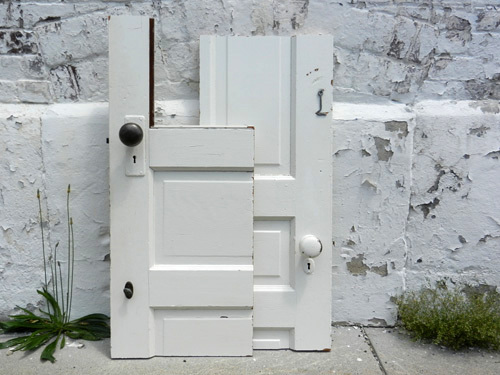 An idea for a post about doors?... or the color black?...surely not The Rolling Stones. I do remember coming to Philadelphia to attend art school and how intrigued I was by the doors of the city. Many were old with character, some ornate, others playful with unexpected colors, not the generic type I was used to while growing up, the new, brown, plain wooden doors. In fact, the first roll of film I ever took with my Yashica camera was of doors... 36 shots, just doors! Hmmm... I'm starting to like this door idea. Later, while straightening up the desktop on my computer, I came across a folder marked 'images'. I had forgotten these by Korean artist Choi jeong-Hwa of an installation he had done back in 2009. I first saw them at Colossal Art & Design. 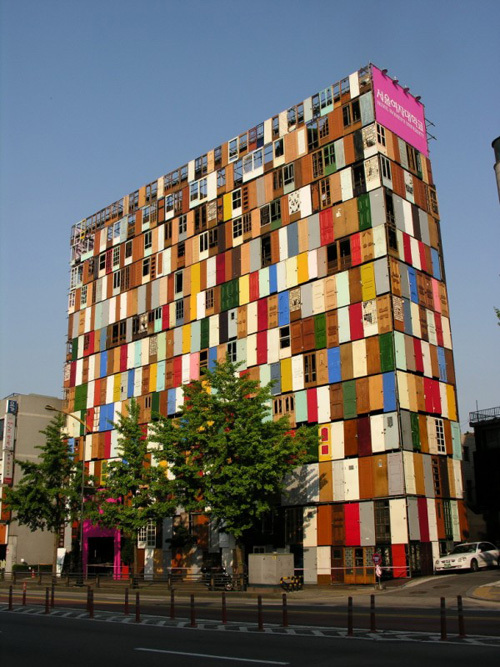 The project was called 1,000 Doors! And then there's this one discarded at curbside as trash. It wasn't there earlier when I started a walk through my neighborhood while talking to my mother on my cell phone about today's post. "Doors, how interesting," she said and added "I've always liked doorknobs." Apparently, mom has a small collection of these knobs purchased at flea markets when she lived on Long Island, NY. I probably wasn't living at home at the time because I don't remember any flea markets or having seen these bits of hardware. What interests her most about the objects is that they have a history and she likes imagining the lives of the people who touched them. They're kept somewhere in her studio in Florida, where she now lives. Curious! "You're trapped in a room with two doors: one guarded by a male platypus, the other by a giant anteater, which door do you try to escape through?" What??? So now the 'Universe' wants to play. I'm game. I chose the door with the giant anteater. I figured...I'm not an ant so this shouldn't be a problem. WRONG! Did you know the anteater has claws capable of killing a human in one swipe!? Or that the platypus gives off a poison that is very painful but won't kill you? Important info if you find yourself with two doors, an anteater and a male platypus. When Michael got home after working at the building (see About Me and Here and Next), I told him all about my day... the worry and the fortune cookie, the 1,000 door project, the door in the street, mom and doorknobs, and the two door riddle on the computer. He smiled knowing how special these synchronistic moments can be. He also solved the mystery of when my worrying first began... "Six years ago", he said. It was when the 'Stutz' building we lived and worked in for so many years was sold for development and we were left scrambling for a new place to live and work. Open, closed, slammed, ajar. 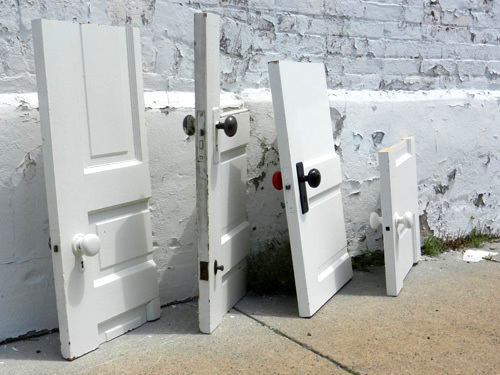 I wonder what the 'Universe' would say about cutting down good solid doors into small pieces and taking them with you? These are 'souvenirs' we took with us when we left our 'Stutz' building in 2006. Remember the television show 'Lets Make a Deal' where contestants are shown three doors, one door often containing a car, the other two, goats? 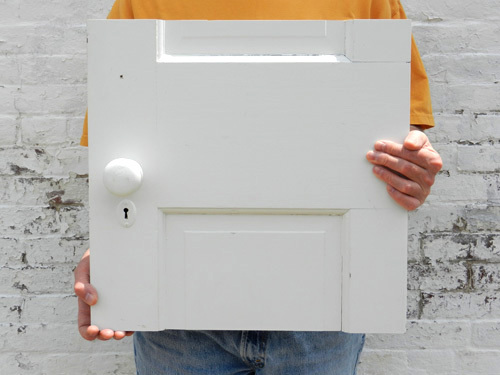 The question was always the same... do you keep your door or trade it for another? Quick answer...always trade. See why here or test it out for yourself here. More on artist Choi jeong-Hwa's work shown here and here. And for fun, the Ball Lines game here. When was the last time one door closed for you and another opened? Has the 'Universe' spoken to you lately? What synchronistic events happened? 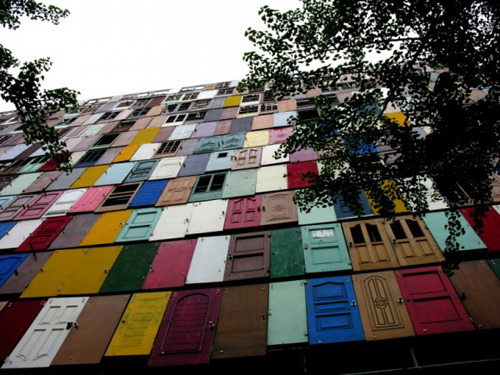 Do you have a door that you love? Send a picture. Pay attention... the 'Universe' may be talking to you. So I was reading "The Miracle of Mindfulness"
and wondering how I might learn the practices connected with being wide awake in the moment. Later that night I was speaking with a friend who told me of this class he was taking on Mindfulness and Meditation. Coincidence? Synchronicity? Intention realized? Since I've begun practicing, it seems that a door to experience has been flung open. A figurative type of entranceway. I am 23 and in a crisis of wondering what to do with my life.. There are so many things that interest me that it's hard to choose. That and my Gemini mind won't let me settle! >< Anyway, before I get too far off point here, let me say this. There are simply four things (okay, branches of tings..)that I battle with choosing between from a day to day basis. 1. Police officer/Detective/etc. I really am unsure but I am feeling this. 2. A novelist/short story writer/journalist. 3. Artist-painter, sketch artist, crafter, etc. and 4. Singer/musician/etc. And, randomness here but connected I feel.. My father recently brought home a black female kitten (closer to adult than baby), she is beautiful, feisty, spunky,instantly fell inlove.. Kicker, dad doesn't like cats too much.. And refused to get any.. I said "The only way I'll move with you guys is if I get a cat." Of course, I was kidding, but anyhow. >< Friday, my dad comes home with a box and a "please don't kill me" look on his face. My mum instantly knew and looked at the box.. "Does it meow?" ".. They do.." Yep, he brought home two brothers, tabby babies. One brown and one gray... Anyway, we just moved here (TX, from TN) recently and the house we bought.. My room doesn't have a door knob on my bedroom door nor a door for the closet. I was thinking of creative ways to utilize these things until we can get proper doors last night. I thought about using genuine crystals and glass beads and making a beautiful red and something else.. I can't recall, curtain for my closet. Well anyhow with that bit of background I can go into the story now. Late last night, near midnight I suppose,(about an hour after the curtain idea) I was laying here playing M.A.S.H.. for career inspiration-I know it wouldn't help but figured my subconsciousness would do a little work for me ><-and I was flipping through the channels on my television and I think it was HGTV I stopped on, something like that, anyhow~ I looked up in time to see a man decorating his kitchen.. Uneat. (;)) he chose hands for handles. Life sized human hands for cabinet doors and the main door.. It was nifty. Some were in the shake position some were giving the thumbs up. I went to sleep a little while later and when I awoke I got to looking up movies to watch to pass the time.. I ended up watching "Intimate Affairs" (or actually, I should say, I am still watching as I took a break to look up synchronicity for what this could mean.) And within the first ten minutes.. There were hand handles.. I was in awe.. How rare they are, amazing to see them twice in only a length of about seven hours.. I came across this because it seemed most relevant.. After reading what you had to say and using my own intuition I have figured it to mean; new opportunities, help, compassion, and a possible decision.. I am a free spirit and as much as I would love to be, I don't use my talents in art.. Perhaps this is the universes way of saying, "It's not just a pipe dream, do it" or something to that extent? Either way, art and beauty surrounds me, and I know already that I love to work with colour therapy.. I'm a bit of a metaphysical person, okay.. A lot a bit. Perhaps there lies my journey? Who knows. I've got until next week really to decide or I'll have to wait until January. It's exciting, yet scary.. In the effect that I don't know that I can do it. Thanks for visiting and leaving your comment. Wow! So many choices, so many signs from the 'Universe'. Isn't Gemini the multi-tasker of the zodiac signs? Do you really have to narrow down and limit all your possibilities? Is it possible to find a way to combine your talents in art, music and writing and apply them? The nice thing about being 23 is that you have lots of time to enter and exit many doors. If one isn't a perfect fit, you can always try another. Loved your doorknob story (human hand connection). Best of luck in your new home and with all your future decisions.